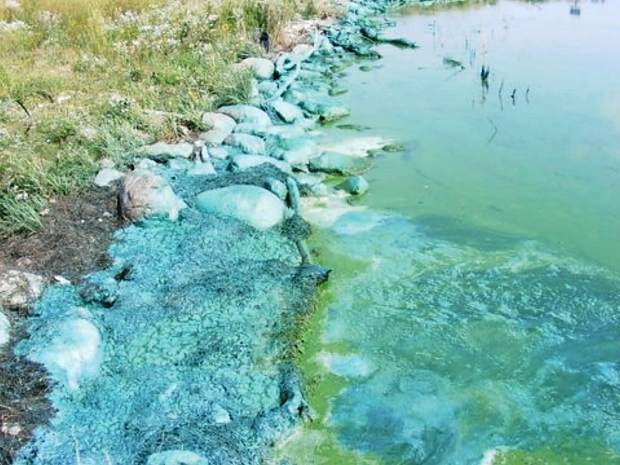 Several livestock deaths have been attributed to blue-green algae poisoning in North Dakota recently, putting livestock producers and veterinarians on alert. Cases usually occur in late summer or early fall, when stagnant ponds and the right nutrient conditions allow for overgrowth of algae, according to Gerald Stokka, North Dakota State University Extension veterinarian and livestock stewardship specialist. However, this spring's mild weather and warm water have been ideal conditions for algae blooms to occur. Blue-green algae, also known as cyanobacteria, typically grow in stagnant, warm pond water. When the algae die, they produce a toxin that is poisonous to most livestock and wildlife, including ducks, geese, rabbits, muskrats, frogs, fish and snakes. Under favorable conditions, blue-green algae can double in number in 24 hours, and these blooms can turn pond water blue to brownish green. "A close watch for unexplained livestock deaths is important," Stokka says. "Consult a veterinarian to find a cause of death so steps can be taken to prevent additional livestock deaths." He also urges producers to take note of any dead wildlife around bodies of water because that could be an indication of blue-green algae in the water. The algae flourish only in the top few inches of water, so toxic concentrations typically are found just in small ponds where waves don't mix the water thoroughly. Blue-green algae blooms do not occur in lakes and rivers. A veterinarian can help determine if a particular pond has toxic concentrations of the algae, Stokka says. Another option is to send a water sample to the NDSU Veterinary Diagnostic Laboratory. The lab also can diagnose a blue-green algae problem in dead animals if someone sends a liver sample. For more information on how to submit samples, contact the lab at 701-231-7527 or 701-231-8307, or visit its website at http://www.vdl.ndsu.edu/. If a pond contains toxic concentrations of blue-green algae, keep animals from drinking the water by fencing off the pond and providing another source of water. Because the toxins are concentrated at the surface, water may be pumped from the bottom of deep sloughs or potholes to watering tanks. Generally, toxic algae blooms last only a few days, but they may persist for several weeks. Small ponds that don't drain into other waterways or bodies of water may need to be treated with copper sulfate or an algicide. Stokka recommends a treatment rate of 2 pounds of copper sulfate per acre-foot of water. That approximates a rate of 8 pounds per 1 million gallons. Toxin levels increase immediately after treatment, so livestock should not be allowed to drink from treated ponds for a week. For more information on detecting blue-green algae and protecting livestock from its toxins, contact your county office of the NDSU Extension Service. Ask for the publication "Cyanobacteria (Blue Green Algae) Poisoning."